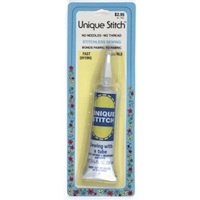 I first used this product way back when I was making stage costumes for rock bands, strippers, and drag queens. There were always sequins, beads, trim, faux "gems" that needed to be added for yet more bling, and sewing all that on by hand would have necessitated my raising my prices significantly. I thought that since these were not garments that needed to be carefully examined by the public...they just needed to look good...that just *maybe* I could get away with glue. Let me tell you that NO glue I ever tried held up. No, not even hot glue (besides, no matter how careful you are, you *will* burn your fingers!) One day I spotted this stuff on the notions wall of my local fabric store, and thought I'd give it a go. WHERE HAD THIS BEEN ALL MY LIFE?????????? Not only does it hold up through as many performances as you can give, it also holds up through hand and mahine washing, drying, dry cleaning, AND it dries completely clear! Now, you may say, "But I don't make costumes for rock bands, strippers, or drag queens." Fair enough. But do you ever make Halloween costumes for the kids? Yep, works for that. Do you ever add a patch or applique to a garment? Yep, works for that, too. Do you ever have a hem fall down? Yep, grab the Unique Stitch for that, as well. How about adding some beaded trim to a lamshade or pillow. Again, yep. The ONLY downfall, and it's minor, minor, minor...is that it's the consistency of Elmer's Glue (don't let the white color scare you...it WILL dry clear) and you do need to pin it or otherwise secure it until it's dry. After that, you're good to go.